The valleys, mountains, and deserts of Utah have been home to native peoples for thousands of years. Like peoples around the word, Utah's native inhabitants organized themselves in family units, groups, bands, clans, and tribes. Today, six Indian tribes in Utah are recognized as official entities. They include the Northwestern Shoshone, the Goshutes, the Paiutes, the Utes, the White Mesa or Southern Utes, and the Navajos (Dineh). Each tribe has its own government. Tribe members are citizens of Utah and the United States; however, lines of distinction both within the tribes and with the greater society at large have not always been clear. Migration, interaction, war, trade, intermarriage, common threats, and challenges have made relationships and affiliations more fluid than might be expected. In this volume, the editor and authors endeavor to write the history of Utah's first residents from an Indian perspective. An introductory chapter provides an overview of Utah's American Indians and a concluding chapter summarizes the issues and concerns of contemporary Indians and their leaders. Chapters on each of the six tribes look at origin stories, religion, politics, education, folkways, family life, social activities, economic issues, and important events. They provide an introduction to the rich heritage of Utah's native peoples. This book includes chapters by David Begay, Dennis Defa, Clifford Duncan, Ronald Holt, Nancy Maryboy, Robert McPherson, Mae Parry, Gary Tom, and Mary Jane Yazzie. Forrest Cuch was born and raised on the Uintah and Ouray Ute Indian Reservation in northeastern Utah. He graduated from Westminster College in 1973 with a bachelor of arts degree in behavioral sciences. He served as education director for the Ute Indian Tribe from 1973 to 1988. From 1988 to 1994 he was employed by the Wampanoag Tribe in Gay Head, Massachusetts, first as a planner and then as tribal administrator. Since October 1997 he has been director of the Utah Division of Indian Affairs. 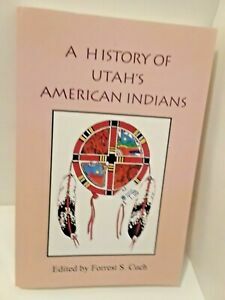 This book is a joint project of the Utah Division of Indian Affairs and the Utah State Historical Society. It is distributed to the book trade by Utah State University Press. This book is a joint project of the Utah Division of Indian Affairs and the Utah State Historical Society. It is distributed to the book trade by Utah State University Press. The valleys, mountains, and deserts of Utah have been home to native peoples for thousands of years. Like peoples around the word, Utah's native inhabitants organized themselves in family units, groups, bands, clans, and tribes. Today, six Indian tribes in Utah are recognized as official entities. They include the Northwestern Shoshone, the Goshutes, the Paiutes, the Utes, the White Mesa or Southern Utes, and the Navajos (Dineh). Each tribe has its own government. Tribe members are citizens of Utah and the United States; however, lines of distinction both within the tribes and with the greater society at large have not always been clear. Migration, interaction, war, trade, intermarriage, common threats, and challenges have made relationships and affiliations more fluid than might be expected. In this volume, the editor and authors endeavor to write the history of Utah's first residents from an Indian perspective. An introductory chapter provides an overview of Utah's American Indians and a concluding chapter summarizes the issues and concerns of contemporary Indians and their leaders. Chapters on each of the six tribes look at origin stories, religion, politics, education, folkways, family life, social activities, economic issues, and important events. They provide an introduction to the rich heritage of Utah's native peoples. This book includes chapters by David Begay, Dennis Defa, Clifford Duncan, Ronald Holt, Nancy Maryboy, Robert McPherson, Mae Parry, Gary Tom, and Mary Jane Yazzie. Forrest Cuch was born and raised on the Uintah and Ouray Ute Indian Reservation in northeastern Utah. He graduated from Westminster College in 1973 with a bachelor of arts degree in behavioral sciences. He served as education director for the Ute Indian Tribe from 1973 to 1988. From 1988 to 1994 he was employed by the Wampanoag Tribe in Gay Head, Massachusetts, first as a planner and then as tribal administrator. Since October 1997 he has been director of the Utah Division of Indian Affairs.